Cockroaches are rather prolific and resilient pests. They can be virtually impossible to exterminate without professional help. Methods of effective cockroach extermination depend on the particular species of the insect and some are harder to get rid of than others. German cockroach (kitchen cockroach) is an indoor cockroach that generally presents the greatest challenge to exterminators, mainly due to their small size and extremely high rate of reproduction. German cockroaches are smaller than most other roach species and can be found all over the world. They have wings, like most coaches, but cannot fly. 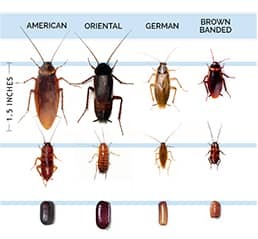 German cockroaches are light-brown in color, 1/2 - 5/8-inch-long and prefer to live in warm and humid places, such as near the kitchen sink or in the bathroom. 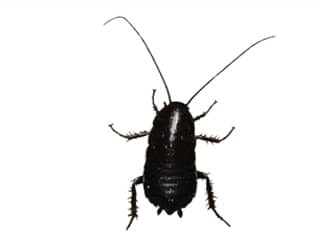 A German roach infestation requires targeted action and consistent, professional treatment. American cockroaches are one of the largest common cockroach species and measure about 1.5 - 3 inches long. They are reddish-brown in color and can be recognized by the yellow band behind their heads. American roaches have wings and can fly, they are a very agile species and can run very fast. 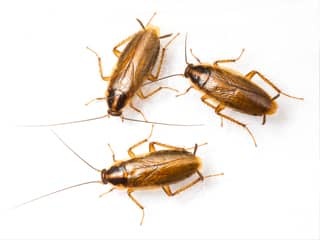 These cockroaches typically live outdoors, in warm and humid places, such as flower beds, drains, sewers, or even on trees. They can enter homes in search of food or water. Once inside, American cockroaches will generally settle under appliances and in kitchen cabinets. Brown Banded is one of the smallest cockroach species. 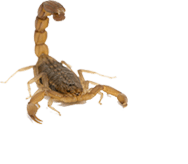 They are light brown (males) or dark brown (females) with a golden-tan band across the wings and abdomen and measure about half an inch in length. These indoor cockroaches tend to avoid water sources and look for dry and warm places. They often congregate in the ceilings and attics or in and around household appliances that give out heat, such as TVs and refrigerators. 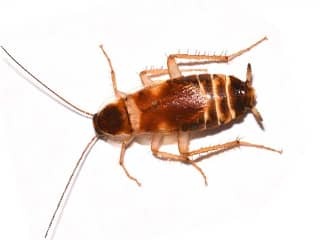 Like other invasive cockroaches, Brown Banded will eat almost anything but prefer starchy foods that include envelope and wallpaper glue and book bindings. Often called water bugs or black beetles, Oriental cockroaches live outdoors and are highly dependent on water for their survival. They are shiny, dark brown species and measure about 1.25 inches long. 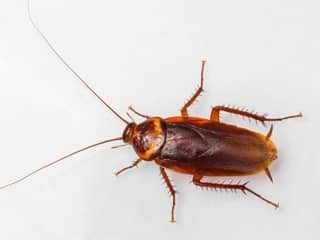 Oriental cockroaches cannot fly: male cockroaches have wings that only cover three quarters of their body while females are totally wingless. Oriental cockroaches often congregate under the mulch beds, in leaf piles, in moist places under gutters, porches, in sewers and drains. They are known for their preference to feed on garbage and decaying organic material. what do cockroaches look like? Are they all the same? While various species do share many of the same characteristics, there are things that are different from one roach to another. Cockroach identification can be difficult if you don�t know what to look for.